In this article we will describe the design time abilities of RadScheduler and the SchedulerBindingDataSource object provided by their Smart Tag. Choose Data Source: Expects a SchedulerBindingDataSource instance. 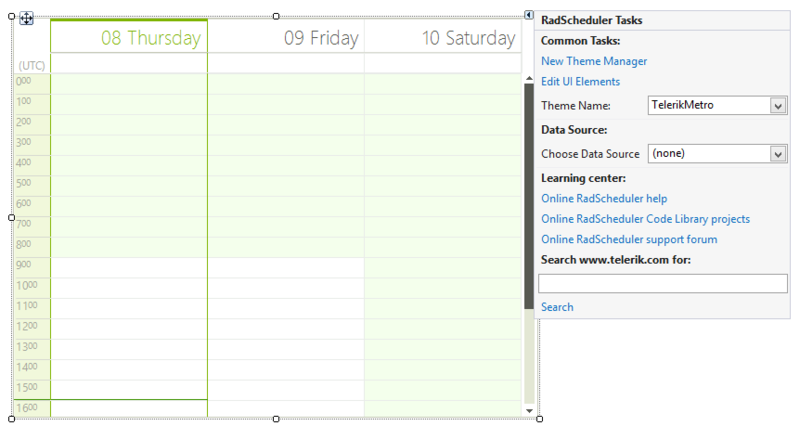 The SchedulerBindingDataSource object can be dragged onto the form straight from the Visual Studio designer. It provides RadScheduler specific actions and one needs to work with it in order to perform a design-time data binding. Choose Data Source: Specifies the data source object of the appointments. 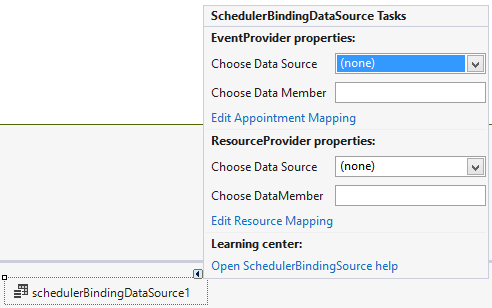 Choose Data Member: Specifies the data member of the appointments data source object. Edit Appointment Mappings: Maps the properties coming from the data source to RadScheduler appointment properties. Choose Data Source: Specifies the data source object of the resources. Choose Data Member: Specifies the data member of the resources data source object. Edit Resource Mappings: Maps the properties coming from the data source to RadScheduler resource properties.